The west side of Kahakapao Loop climbs 873 feet over 2.2 miles. This side is smooth and flowing. While there are less technical features on the west loop, cyclists should still be aware to ride within the limits of their ability. We recommend not riding in wet conditions, but if you must use caution riding over wet roots and in corners of the switchbacks. The west side of the loop tends to remain dryer than the east side. There are several intersections of rogue trails along this route. In order to stay on course, follow the red arrows. The east side of Kahakapao Loop climbs 825 feet over 2 miles of switchback single track. The trail winds through stands of eucalyptus, cook pines and tropical ash. The grade averages 7.7% and gives breaks at several places as the trail passes through gulches. The east side has a few more technical elements than the west. Such technical features include roots and tight corners. Because of these challenging features novice riders should be cautious about descending the east side of the Kahakapao loop. As a climb the trail can be easy or challenging depending on the pace at which you ride. As a descent this trail gives cyclists speed and flow. Tight corners and roots on the switchbacks should be approached with caution. The trail intersects the lower portion of the downhill flow trail toward the bottom. This trail can be slick when its wet and tends to hold more moisture at the top. We recommend not riding in wet conditions, but if you must, use caution riding over wet roots and in corners of the switchbacks. The west side of the loop tends to remain drier than the east side. 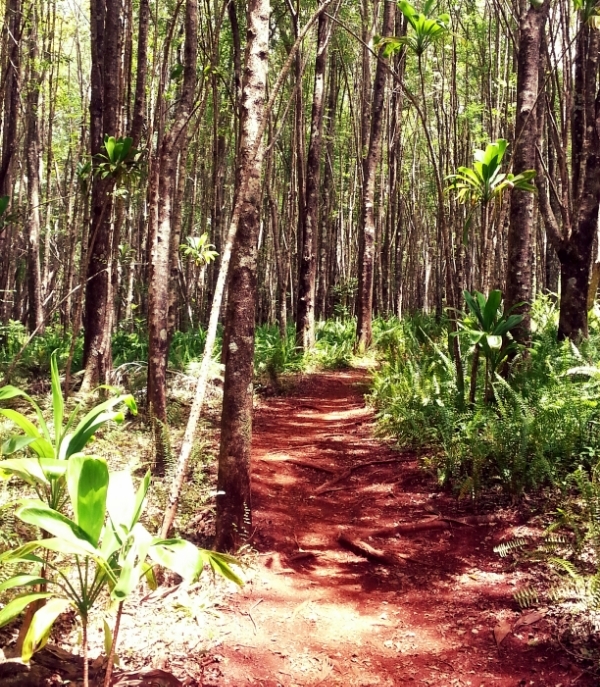 Prior to the development of the Kahakapao Loop, the Renegade Trail was the only single track in Makawao Forest. Renegade is an advance cross-country trail; as its challenging to climb and descend. It rolls, flows, twists and turns down the mountain. Technical features such as fallen branches, tight hairpin turns and exposed roots prevail. One section hugs the edge of a steep gulch and is littered with an array of exposed roots. Renegade Trail intersects the west side of the Kahakapao Loop at the top and bottom. 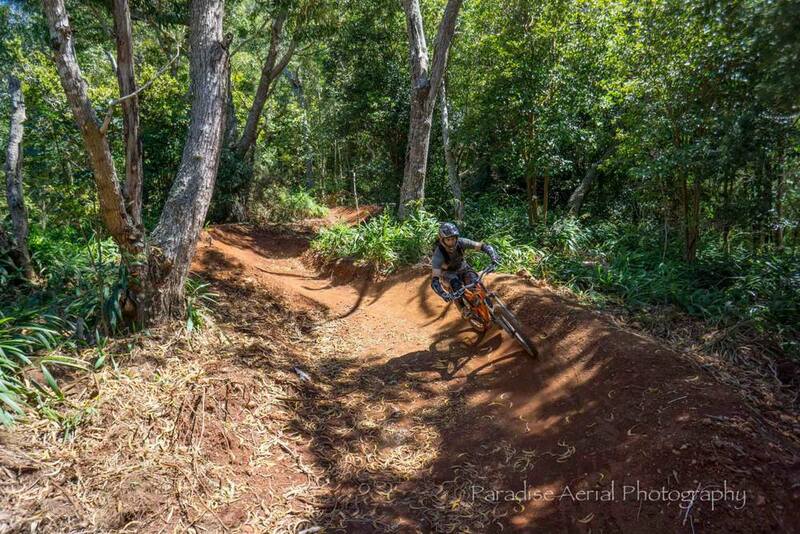 The Downhill/Flow Trail is the Maui Mountain Bike Coalition’s flagship project. The trail is still under development at this time. The lower section, which is complete and open for riding, was built by Trail Solutions with the support of local volunteers in August 2013. The trail is .75 miles long and includes many gravity-oriented features such as table-top jumps, rhythm sections and berms. This is a one-way trail that should only be ridden downhill. The trail is accessible from the east side of Kahakapao Loop trail. The Flow Trail now goes from the top of the East Loop down to the bottom. It is approximately 3 miles of downhill berms and jumps with a big wallride towards the bottom. Have fun and be safe!